Megan's at the Power Station opens in spring 2019. Megan's are a series of small, dog-friendly neighbourhood restaurants in Fulham , Parsons Green , Balham , Clapham and Battersea. Within the Battersea Power Station development, this riverside branch is, like their other restaurants, decorated with flowers hanging from the ceilings. Open all day, it offers home-cooked menus, from a fresh juice or smoothie to kick start your morning to all-day brunch. Try their cooked breakfasts, free-range eggs Benedict or homemade granola along with an organic coffee. On weekends the 90 minute bottomless brunch comes with unlimited Pimm's, Prosecco or Bloody Megan's. The evening offering includes antipasti and charcuterie sharing boards to start, with shakshouka or deconstructed pan kebabs for mains and half-baked Nutella cookie dough or homemade baklava for dessert. BAO Borough opens in spring 2019. Offering a window into late night grill establishments found across Asia, BAO Borough, the third site from cult Taiwanese favourite differs from its sister restaurants. For the first time, BAO fans can enjoy late night noodle dishes from 9.30pm and BAO Borough is home to the brand's first karaoke room, a basement space for 12 guests. Taking inspiration from the historic area of Borough, and its location next to the London Bridge railway arches, the restaurant offers a fun, no frills experience and setting. The culinary style focuses on the grill and there's a grab-and-go option from the hatch at the front of the restaurant. If you eat in, you'll find interiors styled to reflect the look and feel of the Asian late-night grill restaurants this place pays homage to. BAO Borough is the third BAO restaurant by founders Shing Tat Chung, Wai Ting Chung and Erchen Chang, whose portfolio includes BAO Soho and BAO Fitzrovia, XU Teahouse and Restaurant, as well as the original BAO BAR stand which remains at Netil Market. The Hard Rock Hotel London opens on 30th April 2019. How apt that a place once frequented by guitar legend Jimi Hendrix will become the Hard Rock Hotel London. Open in 2019, the same year London gets a new flagship Hard Rock Cafe in Piccadilly Circus, the 1,000-room hotel delivers on its rock n roll reputation with live music by local and international musicians. The location of the hotel, just a 20 minute walk from the original Hard Rock Cafe, is at the crossroads of Oxford Street and Park Lane, by Marble Arch, and so benefits from panoramic views over Hyde Park. Guests walk into at a vast, welcoming lobby lounge - a place that's made for cocktails and live music - with curated memorabilia on display in the hotel and a memorabilia vault, housing some of Hard Rock's 81,000 historical pieces. An on-site Hard Rock Cafe, a Rock Shop in the lobby, a restaurant and speakeasy bar plus free unlimited Wi-Fi complete the package. Upgrade to Rock Royalty and you'll get a luxurious Rock Royalty room and extra perks including a personal concierge and access to a special lounge. A rock n roll hotel in the spirit of Hendrix. The Goring will launch a new restaurant with chef Nathan Outlaw in late spring 2019. Nathan Outlaw, a chef known for his superior seafood, takes over the more casual dining space at The Goring from late spring 2019. With a heavy tilt towards Cornwall - where Nathan has two restaurants with three Michelin stars between them - and its produce, the restaurant offers simple yet superb seafood dishes. Set in an ornate orangery, with architecture and design by Russell Sage, the dining room has wonderful views over The Goring's secluded garden. This is the second restaurant within a five star London hotel from Nathan who also runs Outlaw's at The Capital. at The Capital Hotel. The Goring's seafood restaurant sits alongside its Michelin starred The Dining Room which, with Shay Cooper as head chef, was awarded its first star in 2016. Ballroom officially opens on Wednesday 1st May 2019. Italian meatballs are the hero dish in the New York styled Ballroom which comes with its own speakeasy style cocktail lounge. And their vegan balls are pretty good too. Made with high quality meat from HG Walter, the meatballs come in hand-rolled beef, pork, Thai chicken and Moroccan lamb, served with pasta of the day, couscous, creamy mash or wilted greens as well as homemade slaws and salads. Down in the Ballroom Basement Bar, a vibey, low-lit laidback place with exposed brick walls and tables made from reclaimed parquet flooring, the cocktail menu offers three classics: the Negroni, the Old Fashioned and the Margarita. The stylish diner and basement bar comes from seasoned bar and restaurant entrepreneur Christian Arden who spent his childhood in San Gimignano in Italy, watching his grandmother cooking up all his favourite dishes. 'O ver St James's opens on 1st May 2019. Launched in 2016 by Mauro Palomba, 'O ver is a Neapolitan street food restaurant which uses sea water, extracted from the Mediterranean, to create the dough for its pizzas. The result is a pizza with reduced salt content - 40 per cent less sodium, in fact - and more minerals, making it lighter and easy to digest. Already a success in Borough, 'O ver St James's repeats the familiar, relaxed style of its sister restaurant. Here interiors are inspired by the wilds of Naples with plants and trees creating a romantic, al-fresco atmosphere. Retractable full-height windows lead to a large courtyard terrace while walnut wood tones contrast with Italian Carrara marble and burnished brass. As well as a dedicated pizza chef - Marino Bove, a former teacher at The True Neapolitan Pizza Association - there's head chef Santo Petrone, a Napoli native, who creates dishes inspired by recipes from his grandmother including the Genovese pasta, a 12 hour slow-cooked organic beef and amber onion ragu. Troubadour Wembley Park Theatre opens in summer 2019. Inside the former Fountain Studios, Troubadour Wembley Park Theatre is a temporary performance space created by the award-winning Troubadour Theatres who gave us the King's Cross Theatre, home to The Railway Children. Open in summer 2019, the Wembley venue plays host to the National Theatre's acclaimed War Horse in autumn, from 18th October until 23rd November 2019. The first new theatre to open in Brent in 39 years, the fully flexible space can house 1,000 to 2,000 people seated and includes a spacious modern bar, restaurant and an open air terrace. Troubadour Theatre adds to the growing choice of cultural things to do in the fast changing area where Boxpark Wembley opened in 2018, walking distance away from Wembley Stadium and the SSE Arena. Summer 2019 also sees the arrival of Troubadour White City Theatre in west London. Troubadour White City Theatre opens at White City Place in summer 2019. A new multi-purpose state-of-the-art 1,200-seat theatre comes to White City Place , the old home of the BBC Media Village, from summer 2019 for two years. Set up by Troubadour Theatres, who specialises in this kind of temporary theatre space, the performance hub consists of the main theatre as well as an 800-seat fully flexible multi-purpose space with an interconnecting foyer space complete with a large onsite bar. The team has already enjoyed success with the King’s Cross Theatre, home to the Olivier-award winning The Railway Children, and in summer 2019 it opens not one but two temporary theatres. Troubadour Wembley Park offers a flexible 2,000 seat space on the site of the former Fountain Studios. Both temporary theatres will host a programme of large-scale theatre shows, film screenings, exhibitions and concerts. Hello Darling opens on 2nd May 2019. Theatrical set designers, Darling and Edge, have collaborated with arts venue The Vaults and 2013 Masterchef winner Natalie Coleman to create Hello Darling , a restaurant, botanical bar and eccentric event spaces under one roof. Specialising in sharing dishes, miso-glazed tuna carpaccio, smoked haddock scotch egg and harissa quail are just three of the dishes to divide between friends. The large 80 cover restaurant is lavishly layered with hand-painted furniture, frescoed ceilings and theatrical artwork. Designed to resemble a house, bookable spaces invite you to sit on the kitchen worktops, lounge in the bedroom or sip cocktails in the bathtub. One room even features a giant lion's head and big-top-tent wallpaper. Another, a cosy library, is covered in hundreds of butterflies. The location, behind The Old Vic, also makes it the perfect choice for a quick bite before or after a show. Little Social closes on the 19th April and reopens as No.5 Social on 8th May 2019. In spring 2019 Jason Atherton's Little Social, on this Mayfair spot since 2013, closed to be replaced by No.5 Social , specialising in seasonal British produce and putting chef Kostas Papathanasiou in charge of the kitchen. Formerly at Atherton's Michelin-starred Pollen Street Social , across the road, Kostas has been an important part of The Social Company for the past three years and has worked in some of the UK's finest establishments including The Ledbury and The Fat Duck. Featuring dishes like poached Hebridean halibut and roasted Herdwick lamb chop , the menu focuses on accessible, seasonal ingredients while championing the best of British produce. F or pudding there are sweet delights like Richmond Park honey, oat crumble, milk ice cream and meringue and a chocolate fondant served with homemade blackcurrant sorbet. Interiors at the 60-cover restaurant are much brighter than previously. Earth tones, pale pinks and deep blues create a welcoming atmosphere while banquette seating has been reupholstered with a stylish duck egg blue. Parrillan opens on 10th May 2019. Outdoor dining doesn't come much better than sitting out on the terrace at Parrillan . The partially covered 100-seat restaurant bar and grill is run by the nearby Barrafina, with a menu by Executive Chef, Angel Zapata Martin. For the parrilla, they give you with your own mini charcoal grills, or parrillas, so you can cook meat, fish and vegetables at your table. Ahead of the main grilling course there's DIY to be done, too, in the Pan con Tomate where you assemble your own pan con tomate with toasted sourdough, rubbing it with garlic to your taste. Other snacks include Salmorejo, Escalivada, Cantabrian AA anchovies, Presa Iberica and the Barrafina favourite, Banderillas. The Pavilion Bar and Grill at Kew opens on Monday 13th May 2019. Close to Temperate House and the Great Pagoda, the Pavilion Bar and Grill at Kew is ideal for year-round al fresco dining, perfect for a break from exploring the beautiful botanic gardens. Cooked on an open charcoal grill, dishes at the restaurant include BBQ and orange pork belly ribs, whole bream, a fire-roasted halloumi and vegetable stack, and spatchcock chicken. These are whipped up in front of you on the open charcoal Josper Grill. Best of all, the restaurant, which has room for over 300 visitors, has a large and beautiful outdoor area where ornamental vines have been incorporated into the leafy terrace. Inside, the design is themed around natural materials with muted tones creating a contemporary feel and relaxed atmosphere. With dishes made using herbs from Kew, the menu includes treats for children like mac and cheese, Josper BBQ chicken wings and a family platter for sharing. Maremma opens in May 2019. Housed in the former Montego Inn, on the corner of Brixton Water Lane, Maremma is the debut neighbourhood Tuscan restaurant from Alice Staple and Dickie Bielenberg. Long-standing private chef Alice has a life-long love of Italian cooking which has helped craft the menu which, in true Italian style, is divided into antipasti, primi, secondi and dolci. Tuscan classics like wild boar prosciutto and spinach and arancini are served with cocktails Wednesday to Saturday to toast aperitivo hour from 5.30pm. Dickie, a Brixton resident for almost fifty years, and Alice split their time between south London and his home in Campiglia Marittima, in the Maremma - an unspoilt coastal region of southern Tuscany famed for its salumi, seafood, olive groves and vineyards. Wine comes from small producers, all available for the first time in the UK. The interior incorporates the colours of Maremma - the cypress, pine and poplar trees, the olive groves, the terracotta Etruscan hilltop towns and the blue Tyrrhenian sea. A bit of the Maremma brought to Brixton. The Stratford opens in May 2019. The Manhattan Loft Corporation, the firm which introduced loft living to the UK in 1992 and more recently gave the St Pancras Renaissance Hotel its remarkable makeover, is behind The Stratford, a stylish 150-room hotel which occupies the seven lower levels of the 42 storey Manhattan Loft Gardens. The striking double-cantilevered tower has been designed by architects SOM who were also behind the Burj Khalifa and One World Trade Centre. The mixed used development comes with three 'sky gardens', one on the 7th floor, a second on the 35th and a third on the 36th floor, ensuring that residents are never more than nine stories from an outdoor space. Sharing the use of communal spaces with residents of the 34 storey tower above, hotel guests have access to a swimming pool, spa facilities, daily yoga classes, meeting and conference spaces as well as an external roof garden that overlooks the Olympic Park. Restaurant offerings include Allegra on the seventh floor from ex-Chiltern Firehouse chef Patrick Powell and the ground-floor brasserie from Ben Harrington, formerly of Soho House. The Sunday Times Style Magazine says, "if anyone can rekindle our love of tall buildings, it's Handelsman", the legendary founder of the Manhattan Loft Corporation. GETTING THERE: The site sits to the immediate north of Stratford International rail station and the Docklands Light Railway giving excellent transport links. Wild by Tart Juice Bar and Apothecary opened January 2019 | Restaurant opens in May 2019. From Lucy Carr-Ellison and Jemima Jones, who together are the founders of Tart London, comes this beautiful restaurant, photography studio and homewares store in Eccleston Yards, Victoria. Combining the talents of Carr-Ellison, a photographer, and Jones, a model when the two first met, Wild by Tart is a restaurant, bar, creative and event space - a stunning venue for one-off events like their Christmas Fair and yoga classes, press launches and awards ceremonies. The space works both as a photography studio and a venue for weekly public facing events while the restaurant is open for breakfast, lunch and dinner. Street food bowls and grilled cheese sandwiches are just two of the choices on the menu. At the bar, cocktails, fresh juices, smoothies, good quality wines, local beers and ciders will quench your thirst. In the shop are homeware and kitchen essentials, statement pieces and clothes, designed by Jemima and Lucy. Yiu Fat Noodle opens in spring 2019. Yiu Fat Noodle is the latest restaurant from the group behind Peruvian-inspired London restaurants Pachamama, Chicama, Pachamama East, and Happy End Bar in Moscow. At this Chinatown restaurant, owner Iska Narzi turns his attention to Chinese cuisine, using British ingredients and Western techniques. Interiors feature colourful plastic topped tables and chairs, Aplomb concrete pendant lights, industrial fans and visible cabling. The site, adjacent to Newport Court and Newport Place, has a serving hatch facing onto the pedestrianised part of Central Cross, landlord Shaftesbury's £15 million, 48,000 square foot mixed-use development which includes Sichuan restaurant JinLi, noodle and dumpling restaurant Modern Shanghai, Danish bakery Ole & Steen and cyber cafe Wanyoo Cafe. Darby's opens on 27th May 2019. Robin Gill, who judges the Irish version of Masterchef and who owns and runs The Dairy and the Michelin Bib Gourmand restaurant Sorella in Clapham, is behind Darby's restaurant in Embassy Gardens towers. The most striking feature of the tower is the swimming pool passage suspended 35 metres up. Dishes on offer at Darby's on the ground floor can be ordered by residents and visitors using the Sky Pool ten floors up. Drinks brewed on site, including homemade stout and vermouth, are served from a poolside bar operated by Gill and his team. Back on firm ground, the kitchen has an open fire to prepare ethically sourced ingredients for the menu of Irish-influenced dishes. "Darby's is named after my father", Gill told the Evening Standard, "He spent a lot of time in the States and his era was 40s and 50s and for me it's... what he would have loved." Gold is set to open in May 2019. On the site of what used to be the Portobello Gold pub, Gold is a neighbourhood restaurant and late-night bar which draws on a talented team. Head Chef Theo Hill has come from The River Cafe while the front of house team is in the safe hands of Alex Ghalleb (Pizza East) and Arez Akgundogdu (Soho House). The menu puts the focus on dishes cooked in wood ovens or over open flame and served to share. Wood roasted whole sea bream, burrata served with Parma ham, and wood roasted cauliflower with toasted buckwheat are just three examples. Set over four floors, the ground floor has a bar and open kitchen area, leading out into a lush garden room. With a retractable roof and landscaped with mature trees, the garden room offers a tranquil escape from the busy Portobello Road while the first floor lounge and dining area is topped by a private party room on the second floor. Modern bohemian interiors are by local architect and design duo Felix and Valerie von Bechtolsheim and feature show-stopping art works by Portuguese artist Vhils, who has also created the pavement-to-roof installation on the outside of the building. Suzi Tros will be opening in late May 2019. Brought to you by Adrien Carre and Christina Mouratoglou, the husband and wife team behind Mazi and just a few doors down, Suzi Tros covers the whole of Northern Greek cuisine. N amed after the lovable character from the cult classic 1960s Greek film 'I Parisiana', it literally means 'Suzi, you eat'. Sitting in the light-filled upstairs dining room, you're taken to coastal Greece by the menu of grilled calamari, grandmama's meatballs and grilled and smoked aubergine. In fact, vegetables play a starring role in fresh stuffed pepper and octopus salad. T he downstairs bar offers a more intimate space, the perfect spot for bar snacks, Greek wines and cocktails made using less well-known Greek spirits such as Mastika and Tsipouro. Sit at the counter and enjoy the theatre of head chef John Skotidas cooking on the open charcoal grill. Plans for The Wellington Hotel, approved in 2016, have been scrapped. Actor and hotel owner Robert De Niro, together with Ira Drukier and Richard Born - the team behind celebrity favourite The Greenwich Hotel in New York - have their sights set on their first hotel outside of the US. Plans for the 83-room luxury boutique hotel, The Wellington Hotel in Covent Garden, include a spa, two restaurants, a deli/cafe and a members' club, all built around a central courtyard conservatory. Bounded by Wellington Street, Tavistock Street, Burleigh Street and Exeter Street, The Wellington Hotel will rejuvenate a whole block, spanning six buildings, three of which are Grade II Listed. Historic facades will be retained and incorporated into the new hotel to create a new space, as successfully implemented at The Greenwich Hotel in New York - "popular among celebrities for its hipster aesthetic and luxury facilities" (Telegraph). Norma is due to open in summer 2019. Mayfair hotel The Stafford London and its culinary director Ben Tish are behind this three-floor Fitzrovia restaurant which is inspired by the food and culture of Sicily. Norma puts particular emphasis on the Moorish influences found on the largest island in the Mediterranean Sea. Housed in a converted townhouse on Charlotte Street, the lower two floors are for eating in and the first floor houses a cocktail bar while the top floor a private dining space. A crudo bar at the entrance is dedicated to raw seafood, dressed in delicious olive oils and other flavourings. The main menu lists anti-pasti and pastas, larger grilled meat and fish dishes, all modern Sicilian-inspired dishes made using seasonal Italian and British produce. It's a style of cuisine in which Ben is well versed following his time with the Salt Yard group. Upstairs, in the private dining room, guests can order large family-style sharing dishes including whole fish and platters of seasonal vegetables. The NH Hotel Group opens its first nhow hotel in London in August 2019. British icons from the Royal Family to the London underground give the nhow hotel its distinctive look and feel. This modern 190-room four star hotel, part of the 250 City Road development, is the first UK venture from the brand, joining sister hotels in Berlin, Rotterdam, Milan and Marseille. London-based Project Orange is responsible for the interior design of nhow London which puts a Big Ben rocket sculpture in the lobby and has tables featuring cockney rhyming slang and oversized gold bell lights, a reminder of the city's famous church bells. In the rooms, colourful textures and contemporary art create are best described as punk meets high tech, with graffiti alongside unconventional images of past monarchs. The eight-floor hotel also houses a restaurant called The Bell - a reinvention of the British pub - a bar, gym and three meeting rooms. Magazine London opens in September 2019. A vast event space next to the Thames and overlooking Canary Wharf , Magazine London is a sleek, modern blank canvas, a warehouse style space that's perfect for hosting anything from concerts and parties to conferences, exhibitions, product launches, award ceremonies and dinners. In the heart of North Greenwich, next to Alex Chinneck's upside down pylon, A Bullet from a Shooting Star, the site includes enough space for 3,000 people inside and The Showground, an outdoor space can cater for up to 7,000 - making it perfect for summer parties, large installations, car shows, corporate away days and any event which requires a big fireworks finale. Vibration Group , the team behind the project, has 20 years of experience in the field and offers bespoke event design, set build, decor and production services while the award-winning Moving Venue serves as catering partner. Boulevard Theatre opens in autumn 2019. Fawn James, granddaughter of entertainment impresario Paul Raymond, who opened the original Boulevard Theatre as the Revuebar in 1958 , revives the burlesque and striptease bar as a respectable theatre. Under artistic director Rachel Edwards (director of Sweeney Todd and Founder of Tooting Arts Club), the 165 seat venue presents its own in-house theatre productions together with a late night programme of live music, comedy, spoken word, cabaret and films. Featuring a revolving theatre and cutting-edge VR technology, the innovative space has all the mod cons and the theatre's in-house bar and restaurant is accessed via a two-floor glass bridge. The opening season begins in late 2019. The Prince Akatoki opens in 2019. A new combined brand from StayWell and The Prince Hotels Inc - one of Japan's leading hotel and leisure companies - The Prince Akatoki will arrive in London in 2019. Taking over The Arch London in Marylebone, the new five-star luxury property will be the first hotel from the new brand and will 'reflect the visual elements synonymous with Japan and the signature experiences that are unique to Japanese hospitality'. There will also be a strong focus on mindfulness, service, tranquillity and aesthetic. Mama Shelter London Shoreditch opens in December 2019. After the huge success of their first restaurant in Hackney, Morty & Bob's, named after owner Charlie Phillips' two grandpas, has come to Coal Drops Yard in King's Cross. The all-day dining spot, in an open plan space just off Granary Square, has three selling points: towering cheese toasties, inventive small plates and a global wine list. Industrial brick walls, low lighting and potted plants provide the decor, while the central bar is a hive of activity, comfortably seating a handful of drinkers and diners. As well as sticking to brunch classics which earned them a legion of fans, their evening offering has been upgraded with small plates, bar snacks, crafted cocktails, wines and beers on offer. The 'London Suppliers' bar features Two Tribes, a neighbouring brewery on Caledonian Road, and Camden Town Brewery while wines showcase British grapes grown in Hampshire and Essex. Come for coffee, cocktails and quite possibly the best cheese toasties in town. After causing an Instagram flurry with their cute custard steamed buns, Chinese cafe Bun House adds a second, larger restaurant to the Greek Street original with this two floor venue on Lisle Street, in the heart of Chinatown. As well as the popular traditional Cantonese steamed buns - the char siu pork belly Pig Bun is especially cute - two new additions join the menu: beef brisket; and a soft, brioche-style pineapple bun. The Chinatown restaurant, which seats approximately 72 guests over two floors, also includes a small hatch from where traditional street food style snacks such as curried fish balls and Cheung Fun (traditional rice noodle rolls topped wok-fried vegetables) emerge. Cosy interiors are colonial in style, with dark wood highlighted by brass fixtures and comfortable rattan furniture. Based on a fictional flatshare between friends, The Little Yellow Door is a house party that you can invite yourself along to. Going from pop up to permanent, the Notting Hill cocktail bar has found a longterm home on All Saints Road. Set over two floors, the flatshare is a home from home, complete with open plan kitchen and a living room with fireplace and sofas. It's filled with colourful and quirky finds, mismatched furniture - the ideal spot for early evening cocktails and dinner. Downstairs discover a secret hideaway open till 2am. The Flatmate's Den is kitted out with backgammon and poker tables, retro games and a music corner for vinyl records and DJs. Weekends are set aside for Saturday bottomless brunches and Sunday roasts; classic home comfort dishes. As with The Little Blue Door in Fulham, you need to let the flatmates know you're coming in advance via WhatsApp. Winner of three Michelin stars Spanish chef Eneko Atxa, whose restaurant Azurmendi on the outskirts of his native Bilbao is currently ranked number 16 in The World's 50 Best Restaurants, joins forces with One Aldwych Hotel to bring Londoners his award-winning Basque country cuisine. Taking a new direction with this 110-cover restaurant Covent Garden restaurant and wine bar, Eneko - Basque Kitchen & Bar is an unpretentious, modern take on rustic Basque cuisine. Starters include the Txerri Boda Pork Festival - a trio of Iberico ham and mushroom duxelle in milk bread, suckling pig brioche and pigs trotter bocata. Basque-style hake tempura, red pepper sauce and parsley emulsion and creative vegetarian dishes like dressed beetroot tartare as well as bomba rice risotto with Idiazabal pesto are among the mains. Finish with Eneko's signature rice pudding lollipops with crisp white and dark chocolate hazelnut coating. Six years in development, Kebab Queen raises the humble kebab to Michelin star aspirations through a seven course tasting menu by Manu Canales, previously sous chef at Le Gavroche. Below Maison Bab and hidden behind the illuminated facade of a classic British kebab shop is this chef's table restaurant with room for ten diners, seated on cobalt blue, leather-clad stools. Here Manu leads guests through the dishes, imparting his love of kebab, cultivated during his trips across Turkey and beyond. The meat feast includes starters of foie gras kebabito and a doner risotto - rice in lamb jus finished with chilli and garlic sauce and shavings of lamb tongue. To finish, there's 'Got Milk?' - freshly baked, sticky milk buns filled with caramelised cream and topped with creme fraiche sorbet. No more will the meat dish be seen as something you'd chow down after too many pints. Exclusive private members' club Home House branches out to open this sister club, Home Grown , in Marylebone in April 2019. Members, who include the founders of Seedlip and Planet Organic , have access to the club's brasserie-style restaurant, the study cafe, bars, business lounges, meeting rooms and pitching suites, all complete with state-of-the-art technology, as well as the club's 35 bedrooms. Special events, f uelled by champagne and canapes, include the Rockstar Series, an intimate set up where the speaker is a well known entrepreneur. Kelly Hoppen and Simon Woodroofe, Founder of Yo Sushi!, are two the speakers lined up for the first week. Each 'Rockstar' appears 'in conversation' with another entrepreneur, giving insights into their business journey. M embers also have access to business leaders and mentors and can recharge at monthly sound meditation and yoga classes, or unwind at the Home Grown Sipping School drinks club hosted by Alison Taffs. A stone's throw from Old Street station, Serata Hall has its own in-house gin distillery and built in bakery. Add in super-fast Wi-Fi and hot desk spaces and you've got an ideal day-time spot for freelancers. At evening time and the cocktail trolleys come out and DJs and live bands provide the soundtrack to your night. Sign up to Gin Blending Masterclasses and you can learn how to blend, bottle and name gins to take away. In between, freshly made food - including pastries, cakes, bread and pizza dough - is created on-site daily. Tiny Tower Bakery, the in-house bakery, provides freshly baked goods until 5pm to eat in or take away, from pistachio croissants to blueberry lemon drizzle cake and Italian bomboloni doughnuts with jam or Nutella. Pasta dishes and more substantial mains include two-hour slow beef ragu and fried vegan 'chicken'. The fourth site from Albion & East, it joins sister sites Martello Hall in Hackney, Canova Hall and Cattivo, both in Brixton. From the team behind Flat Iron Square, and in common with that nearby attraction, Vinegar Yard sits directly under the gaze of The Shard. Open everyday for breakfast at 7.30am, the market features street food and vintage finds at the Flea Market. Food comes from some of London's top traders including Baba G's, Up In My Grill and more, there's a coffee house from The Gentlemen Baristas, open air bars and pop up shops with vintage and makers stalls. In the middle of it all is a huge open air garden area with outdoor seating for hundreds of people at communal tables, plus there's a large indoor space for when the British weather isn't on side. The height of urban chic, the site is surrounded by monumental art installations from British artist Joe Rush and visitors can see Joe's and his team working on apocalyptic mechanical sculptures at his onsite workshop. A collaborative project from one of the 50 best, thrice Michelin starred Valencian chef Quique Dacosta and his London team, Arros QD showcases Quique's distinctive modern style of cooking. The focus is on rice, a food that doesn't typically get star status at high end restaurants, so you can expect plenty of paella made with really good quality Spanish ingredients. Described as a "culinary genius" by the Michelin men, the self-taught chef was awarded three stars for his Quique Dacosta restaurant in Denia and one Michelin star at El Poblet in Valencia. Inspired by the L'oscar hotel's Baptist Bar, which is housed within a former chapel dating back to 1903, Café L'oscar takes on a Saint & Sinner theme for its decadent afternoon tea. Served against a richly decorated backdrop of mirrors, gilded panels, original art and a striking illuminated onyx bar, the afternoon tea commences with Religieuse buns followed by finger sandwiches filled with devilled chicken, rare roast beef and poached salmon. The suitably themed sweet treats include Adam and Eves pudding, Devils food cake and Saint Nectaire and blood orange cheesecake, and no afternoon tea is complete without traditional scones served with cream and jam. To wash it down, saints can choose from an extensive tea selection while sinners can sip on indulgent tea-based cocktails, including the Charon au champagne with Rooibos tea infused Ketel one, blood orange and champagne. Bringing a taste of Alsace to London, Flamboree offers a contemporary spin on the tarte flambee. This quintessential Alsace dish is bit like a pizza but with a wafer-thin light base. With no yeast, the bases are rolled then baked in 80 seconds in a custom gas-fired rotating deck oven. The result: a light and crispy base. For the toppings, the classic tarte flambee comes with Dingley Dell smoky bacon lardons, creme fraiche, red onions, Emmental, and herb aioli. But chef Neil Witney (previously Executive Chef of La Bodega Negra, Casa Negra, E&O) has come up with some unusual combinations, taken from his travels around the world. Highlights include Beware the Taliwang - roast chicken with spicy taliwang and Indonesian sweet soy sauce - The Royal Levantine (roasted peppers and aubergines) and The Great Veganer; coriander and lemon hummus with slow roast tomato. Finish with the sweet Flam-Smoree and you'll get a mix of dark chocolate sauce, white chocolate chips, smashed biscuit, marshmallow and a scoop of ice cream. O n the site of the original Bovril factory in Shoreditch, the 75 seat restaurant is fun and bright with a colour palette borrowed from the buildings in Alsace and Bovril posters on the walls. All day modern Asian cafe, Bambusa, on Charlotte Street is a casual grab-and-go coffee spot open for breakfast, coffee and lunch. Located in Fitzrovia, it's the first cafe by restaurateur Rohit Chugh, founder of Roti Chai (Marylebone) and Chai Ki in Canary Wharf, and features food he enjoyed when travelling and working in Japan, Singapore, Laos and across Asia. In dishes like ginger shoyu chicken and kimchi BBQ jackfruit, fermentation and umami are key with kimchi, miso and nam pla adding health benefits as well as depth of flavour. B reakfast options include sriracha egg scramble buns, omelette sliders and chia coconut yoghurt or fresh pastries from east London bakery Galeta. Grab a c offee and pastry, build your own breakfast and lunch to go or eat in - there's seating for up to ten - and take in the bamboo green tiles, polished plaster and hand-crafted metalwork. Cult Korean street food restaurant On The Bab serves bibimbab, bao and the new Korean-style wrap - which has been especially created for Soho - by Linda Lee. Available to eat in or takeaway, the menu features street-food favourites including Kun Mandu dumplings, Yangyum Korean Fried Chicken and a new vegetarian dish exclusive to Soho, Dooboo Bab - tofu cooked in spicy gochujang sauce with Asian vegetables. One of four On The Bab restaurants in London, other locations can be found in Covent Garden, Shoreditch and St Paul's and Linda Lee also owns fine-dining Korean BBQ restaurant Koba in Fitzrovia. Atul Kochhar, the first Indian chef in the world to receive a Michelin star, launched his new venture in 2019 with the opening of Kanishka on Mayfair's Maddox Street. Created in partnership with Tina English, former commercial director of Cinnamon Club, the restaurant explores the lesser known regions of India with dishes that showcase the food of territories such as the Seven Sister States in the most eastern region of the country. Kochhar's cooking also explores the influences that neighbouring countries such as Nepal, China and Bangladesh have on the states. Signature dishes include the likes of Venison Kachela Maas, a Sikkim inspired venison tartare, and Seafood Alleppey Curry, a dish of pan seared seafood and coconut and turmeric sauce. The drinks are also a big part of the experience with a range of signature cocktails and more than 50 different whiskies to choose from, many of which have been sourced from India. The third Near & Far from the group behind The Magic Roundabout and The Good Mixer is the biggest. This Camden flagship, set over four floors, has room for 180 making it the big sister to sites in Peckham Levels and Angel. Palm Springs sets the tone with pastel hues, lush greens, desert shades, palm trees and cacti filling the interior. Opposite The Stables and the Roundhouse, Near & Far Camden has a lounge area, two bars and a covered roof terrace open all year round offering a relaxing haven from the bustle of Camden town. The cocktail menu is inspired by world travels while Mexican street food is served daily by Alex Hutton's pop-up kitchen Elote. Open seven days a week, with a late licence until 2am Thursdays to Saturdays, Near & Far is a perfect weekend party destination with DJs playing Latin and Balearic house and laid back disco. Following the success of St Leonards, former Brunswick House chefs Andrew Clarke and Jackson Boxer take inspiration from the western isles of Scotland, where Jackson spends his summers, for this 50 seat restaurant in Notting Hill. With a strong emphasis on seafood, the menu lists oysters, langoustine, scallops, razor clams, crabs and lobster - all native to the Hebrides and flown down daily. Simple, approachable dishes are the order of the day, served with leaves, vegetables, honey and eggs from their organic farm in West Sussex. A wine list of around 60 bins of excellent reds and whites from Burgundy and Northern Italy is supplemented by glass and carafe wines served via taps and kegs, preserving the quality of fresh, young wines. Pretty-in-pink cake cafe Peggy Porschen has added a second outlet, with this Chelsea shop at 219 King's Road joining the original in Belgravia - whose pink facade and seasonal floral displays have attracted 375k followers on Instagram. Founded by cake maker to the stars Peggy Porschen and husband Bryn Morrow, the Chelsea cafe is elegant and contemporary with a private event space. It combines freshly baked cupcakes, cookies and layer cakes with beautiful, picture-perfect interiors in keeping with the brand's romantic look. Changing with the seasons, Love Heart cupcakes are topped with a heart for Valentine's Day while strawberry rhubarb and rose cupcakes come with a bunny or pink tulip design for Easter. Open for morning coffee and croissants through to evening drinks in the Pink Peony Bar, the cafe offers seasonally inspired menus across two floors and each room has its own unique sweet and savoury offering. The pretty All Day Dining in the Salon gets a full savoury menu from spring/summer 2019, along with extended opening hours to 10pm. It started in 1984, when Hugh Corbett opened the first Slug and Lettuce in Islington and created a new, female friendly pub with bright, open spaces and vases of flowers on the light oak tables. The chain of bars has moved with the times and at this Slug and Lettuce l ocated on Minories, gave what used to be Abbey bar a half-a-million pound facelift in 2019. Bold prints, touches of neon and flashes of gold give the place a modern feel. In the heart of Tower Hill and just around the corner from Aldgate Station, the venue offers new birdcage seating areas and caters for everything from a from girls' nights out to hen parties, a breakfast meeting or birthday. Book in for a cocktail masterclass or reserve the mezzanine VIP area for an extra-glam experience. Adam Handling, the award-winning chef behind the Frog restaurants in Hoxton and Covent Garden, has his biggest project to date with Adam Handling Chelsea , the main restaurant within the Belmond Cadogan Hotel. A year in the making, t he 45-seat restaurant takes a sustainable approach to cooking and dishes like lamb Wellington have been created with destination diners, hotel guests, and locals in mind. The menu, larger than those at any of Adam's other Frog restaurants, is 'inspired by London' and uses quality ingredients from across the British Isles. A large, open kitchen and counter dining alongside the main restaurant area are part of the design, created by Adam in collaboration with Russell Sage Studio, which includes artworks by Katy Jade Dobson, whose paintings already feature in Adam's Hoxton bar, Iron Stag. Adam is not only looking after the main restaurant, but the entire food and beverage offering throughout the luxury hotel and the two-hour afternoon tea promises to be something special. Neighbourhood pub The Perky Nel combines a large bar and dining space with British food and traditional pub drinks from local suppliers and producers. Just down the road from Clapham South underground station, the pub has an impressive front terrace, perfect for drinks overlooking the Common. Live entertainment and sports are also part of the package with a dedicated sports area where all the latest games are shown on giant screens. A decent local, offering everything from pub quizzes to seasonal parties, The Perky Nel is the second Clapham location for south London based independent pub group Livelyhood, joining sister venue The Clapham North which underwent a large refurbishment in 2018. The Livelyhood family also includes The Regent in Balham, The Old Frizzle (Wimbledon), The Mere Scribbler (Streatham) and The Faber Fox in Crystal Palace. Victor Lugger, Tigrane Seydoux, and the team behind La Felicita and Pink Mamma in Paris launch in London with this Big Mamma of an Italian trattoria, Gloria. With the look and feel of Capri in the 1970s, the dining room is full of decadent Carrera marble, greenery and antique Italian ceramics. The two-floor Shoreditch restaurant also includes a private wine room, filled with 3,000 bottles of Italian wines. Downstairs, mirrored ceilings and velour banquettes are dotted around a sunken kitchen. Italian classics like La Gran Cacio e Pepe, served in a whole wheel of Parmigiano-Reggiano, and retro puddings like profiterole Napoletana fill the menu - and it's open till 2am at weekends. This Marylebone restaurant, bar and bakery is the debut venture from Kelly Landesberg. Housed in an opulent space, decorated with hand-painted silk wallpaper, mother of pearl floors and plush velvet low lit seating, A.O.K Kitchen & Bakery takes inspiration from the sun-soaked shores of the Mediterranean and California. In the restaurant bar you can enjoy fresh juice spiked cocktails and there's private dining 'snug' area. Downstairs, the bakery focuses on bakes free from refined sugar, including pastries, breads, bespoke cakes and Kelly's favourite Cholla loaf - a traditional Jewish braided bread eaten on the Sabbath and Jewish holidays. The team of talented chefs include the executive head chef and pastry chef from The Arts Club - the bakery has the backing of co-founder Jai Waney - with Kostas Rampias, former Head Chef at Momo's leading the kitchen. After a successful pop up in Brick Lane, modern Chinese restaurant numnum has set up shop in Southwark, just a two-minute walk from the station. Specialising in Southern Chinese wok dishes , noodle, rice and roasted mains like wonton noodle soup and roasted chicken are served with side dishes. Delicious homemade broths are made from scratch by Chinese chefs from different regions of Southern China. The short menu, which reflects the chefs' regional differences, changes to use seasonal ingredients and with just five mains, the chefs can focus on doing a few dishes well. You can eat in at the the 40 cover no-reservations restaurant, take out or order via Deliveroo and Ubereats. Giving Catford's oldest pub a new lease of life, Ninth Life adds live music, a food market and a nine-room immersive theatre space to create a pub with a festival vibe. Art projects and local film screenings, games nights and drag-queen bingo are all part of the programming as well as daytime showcases from local youth groups, graffiti festivals, spoken word and art exhibitions. L ed by Creative Director Dr Claire MacNeill, the cultural community is at the heart of this refurbished pub. Its packed events programme makes the pub a local creative hub for South-East London. E xpect seasonal daily specials, locally sourced tipples (including Laine beer, Brockley Brewery and Village Brewery) and on Sundays there's a focus on traditional roasts served with up with an afternoon of live music. The Street Food Union market serves quality cheap eats from street food traders on a regularly changing rotation so there's always be something new to try. Among the livery halls, guilds and narrow streets of the City, you'll find Vintry & Mercer, a hotel with 92 rooms and suites, a roof terrace, all-day restaurant, underground speakeasy and its own fitness studio. Taking inspiration from the historic trading guilds of the area, plush velvet curtains, bespoke fabrics and leather door handles to the rooms are a nod to the merchant taylors who used to trade their wares on the nearby streets. The name comes from the historic trading guilds of the area. Vintry references the wine merchants while Mercer recalls the textile sellers who specialised in fine silks and damasks. Mediterranean dishes are served in Vintry Kitchen on the ground floor, while sustainably sourced meat and fish from the British Isles are a speciality at Mercer Roof Terrace with views overlooking the dome of St Paul's Cathedral. Hidden away beneath is Do Not Disturb, a discreet, late night underground speakeasy cocktail bar taking inspiration from the clandestine bars of 1920s New York. Six years after setting up Yeni Lokanta in Istanbul, founding partners Cem Bilge and chef Civan Er bring Yeni to Beak Street in February 2019. 'Yeni Lokanta' which translates as 'New Eatery', reflects Istanbul's rich heritage as the meeting point of Asia and Europe which means you get everything from the koftes and street food to traditional meyhanes of seasonal fish and vegetables on the menu, served with wine and raki. The original restaurant in Istanbul has a loyal following - Civan was awarded GQ and Time Out's Chef of the Year in 2014 - and you can see what the fuss is about when you try Yeni's famed oven-roasted ribs and octopus with 'salty fingers' from the josper grill. Enjoy vegetables braised in olive oil and aubergine filled manti with goats yoghurt while surrounded by floral motif Levantine tiles and hand blown glass chandeliers from craftsmen across Istanbul. Sea green tiles top the tables and the solid Onyx wall behind the bar reflects the soft glow of the old market town. Occupying a two floor seventeenth century building on the spot where Carvosso's used to be, The Crown is a project that's especially dear to owner Henry Harris who's been a local for 21 years. The fourth site from acclaimed chef, the restaurant offers a Mediterranean menu and classic roasts cooked by Sicilian born head chef Daniele Zaffora who has worked with Henry previously at Racine as well as the Dover Street Arts Club. Together with business partner, James McCulloch, Harris has a collection of London based pubs with dining rooms: Three Cranes in the City (opened in 2017) as well as The Coach in Clerkenwell and The Hero of Maida, both opened in 2018. Previously a police station and stables, the Chiswick restaurant has capacity for up to 120 in the dining room and comes complete with a bar, dining room, courtyard, and private dining rooms. All about community, guests are invited to enjoy good food and wine in welcoming surrounds, overseen by Ruth Leigh (Le Cafe Anglais, Dock Kitchen, The Hero of Maida) who is also a local. Bringing Shanghai to Chinatown Shanghai Modern specialises in delicious dumplings, noodles and traditional Shanghai dishes. The restaurant, done up with glossy black and white chequered flooring and tall ceilings, has been designed to fit in with 'a modern Shanghai'. Note the marble-patterned tables, exotic wallpaper in the washrooms and exquisite Chinese antiques resting in the wooden cabinets. Primarily serving Shanghai cuisine, recommended dishes include pan fried dumplings, soft shell crab pineapple fried rice, xiaolongbao filled with shredded chicken. Authentically Swedish but originating in Edinburgh, Soderberg has brought the Swedish concept 'fika' to Soho. Translated simply as 'coffee break', fika is an important part of Swedish culture and the coffee here is roasted in Sweden by Johan & Nystrom. Serving high quality food, Soderberg's menu includes open sandwiches, smorrebrod, bread and pastry as well as popular treats such as its signature Kardemummabulle (cardamom buns) and Kladdkaka (chocolate cake). Enjoy sit-in brunch and takeaway breakfast and lunch options, Scandi-inspired cocktails, natural wines and craft beer. Located within the Centre Point development, Vapiano is a popular pasta place where you top up payments as you go, making it especially popular for group outings. With its carb based dishes, cooked by a chef while you watch, and 'top up' card payment system, it's easy to see why it's a hit with friends who want to avoid the hassle of splitting the bill. There are ten different pasta shapes - penne, campanelle and tagliatelle as well as spaghetti and fusilli spelt - making up 20 different dishes on the menu. Everything from sauces to dressings, dolci and dough are made daily from scratch on site so you get quality food in a relaxed, casual setting. Herb pots are on every table so you can freshly season your meal yourself. This Vapiano at Centre Point, the fifth London restaurant from the group, is massive. 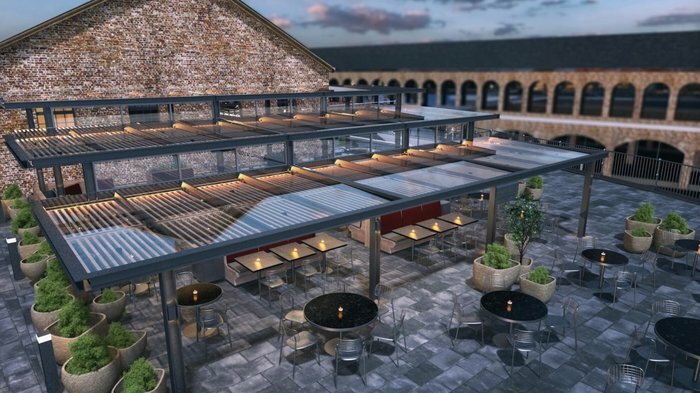 It has 357 covers split over three floors (including an impressive mezzanine level) as well as additional seating outside on the piazza - perfect for the warmer months. The main floor features a colourful mural by Graffiti Kings, a 'floating' vespa and brutalist window frames, letting in lots of natural light. This site launched in late 2018, soon after Vapiano Tower Bridge which overlooks the Thames and Tower Bridge. With custom vintage Air Partner speakers and a 2am licence, Spiritland is a dining space for music lovers. It started in 2016 with the opening of its cafe, radio studio and listening lounge in King's Cross with but this 180-cover restaurant in Royal Festival Hall is its largest in London with nearly three times the capacity of the King's Cross original. A welcome addition to the Southbank Centre, Spiritland Royal Festival Hall offers everything from an early-morning to late night celebration of food, drink and music culture. New Zealand-born Head Chef Moondog (The Providores and Tapa Room) brings a fresh menu of sharing plates and twists on classic favourites and there's an open grill and oyster bar. Regular talks and events, programmed with the help of arts broadcaster John Wilson, host of BBC Radio 4's Front Row, include appearances from high calibre guests - Bill Nighy, Tom Dixon and Irvine Welsh have all been speakers at Spiritland events. Gizzi Erskine and Rose Ferguson team up to give us F!LTH , a plant based pop up at Dirty Burger in the Tea Building in Shoreditch. Serving healthy food for hedonists, FILTH! offers the protein rich signature burger made from black beans, black quinoa, GMO soy mince and a special umami paste. It's just one of the choices on the menu which includes the Seoul Burger - a patty in between a carrot and turmeric bun - sides of sweet potato fries served with seaweed miso dust, salads of kale, broccoli, lemon, almond and cashew umami as well as plant based shakes. Made using Booja Booja ice cream, the thick shakes come in salted chocolate cacao nib and creamy strawberry. As Dirty Burger is owned by Soho House it's only natural that F!LTH will expand throughout the houses, with the signature patty to be introduced to all seven London houses. From cheap budget places to stay to luxury 5 star suites see our discounts for hotels, including Holiday Inn Express London-Victoria from 62% off.